Chicken Fat Mushroom (Suillus americanus) is a widespread and very common “Slippery Jack” mushroom. It occurs in North America east of the Rocky Mountains. It is very common in the United States from the northeast to the Midwest, and in adjacent Canadian provinces. It is common Minnesota in the northeast, north-central, and metro regions. It grows on the ground, usually in groups but not clustered, exclusively under eastern white pine. It is found from mid-July to mid-September in mixed and coniferous forests and anywhere else its host is found. 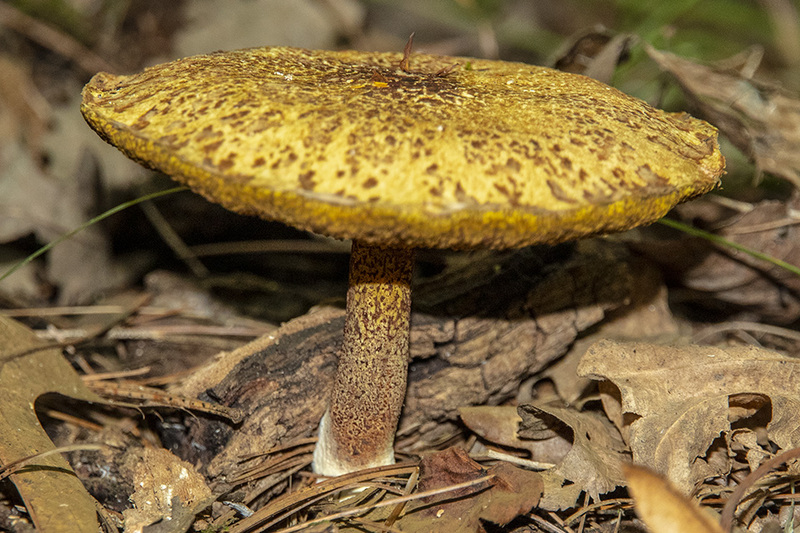 When young, the cap is bright yellow, convex, and slimy. As it matures, the cap becomes broadly convex and sometimes has a small bump in the middle. The mature cap is sticky or slimy when moist, and frequently has reddish-brown scales, streaks, and/or patches, especially near the margin. The underside of the cap is a sponge-like pore surface. Chicken Fat Mushroom is edible but the taste is not distinctive, and the cap becomes slimy when moistened. After removing the slimy skin and the spongy pore surface, there is little left to enjoy. This entry was posted in Fungi and tagged Chicken Fat Mushroom, Suillus americanus on November 27, 2018 by John Valo. King Alfred’s Cakes (Daldinia concentrica) is a common fungus that occurs on all continents except Greenland and Antarctica. It grows on dead or dying deciduous wood, especially ash. The fruiting body is ball-shaped, stalkless, and hard. It is brown when young, black and shiny when mature. 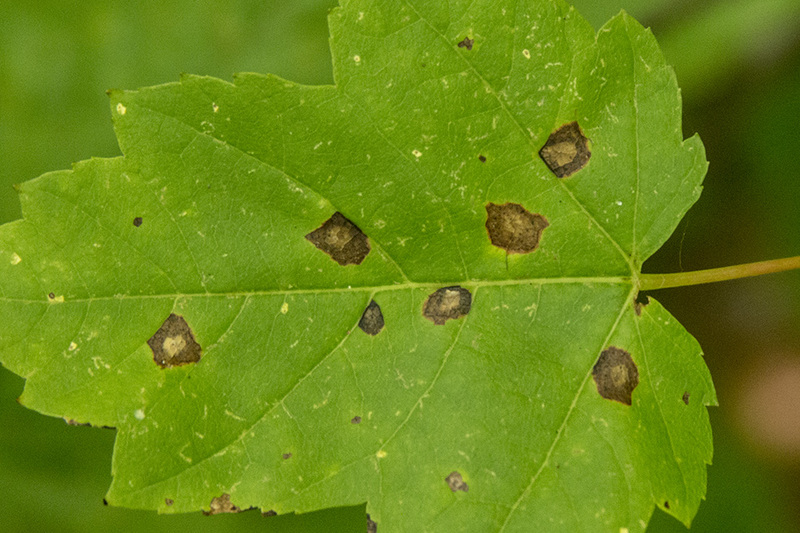 The surface is densely covered with minute, pimply bumps. These bumps are tiny, spore-bearing chambers just under the surface. When the spores are mature they burst open during the night and eject up to an inch or more large numbers of black spores. These spores are often visible on the bark near the fungus long after they have worn off the fruiting body. The common name King Alfred’s Cakes refers to a story told about a British monarch. King Alfred fled from a battle and took refuge in a peasant woman’s house. The woman asked him to watch her cakes in the oven. Preoccupied with his own troubles, he let the cakes burn. This earned him a scolding from the woman who did not know her visitor was the king. King Alfred’s Cakes is also called Coal Fungus, but not just for its appearance. An older, black specimen, when broken to expose the interior, will readily take a spark from a fire steel. Blow on the glowing spark and it will grow in size. Left alone, it will smolder for a long time. Placed against dry tinder and blown upon, it will ignite a fire. Another common name, “Cramp Balls”, refers to the belief that when carried in a pocket it can prevent or cure leg cramps. 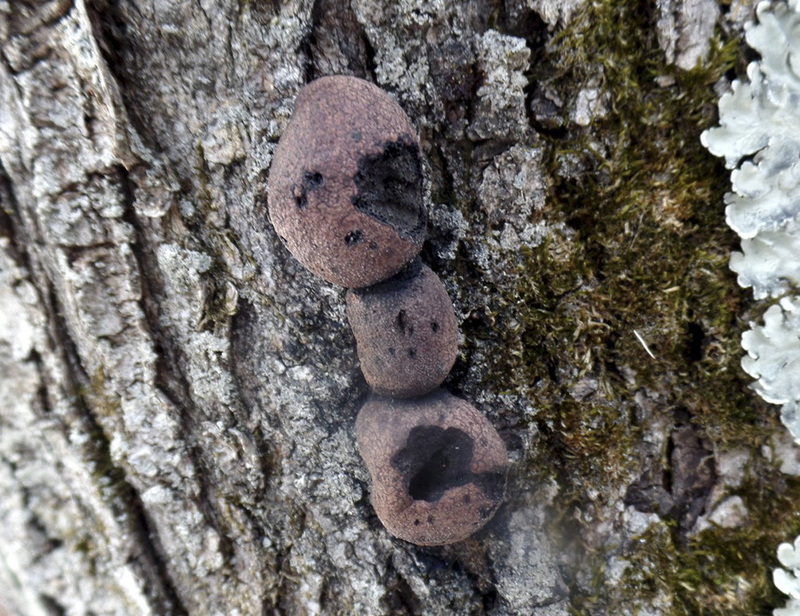 This entry was posted in Fungi and tagged Daldinia concentrica, King Alfred’s Cakes on November 20, 2018 by John Valo. Common Bird’s Nest (Crucibulum laeve) is called that because it looks like a bird’s nest with several eggs. It occurs on all continents except Greenland and Antarctica. 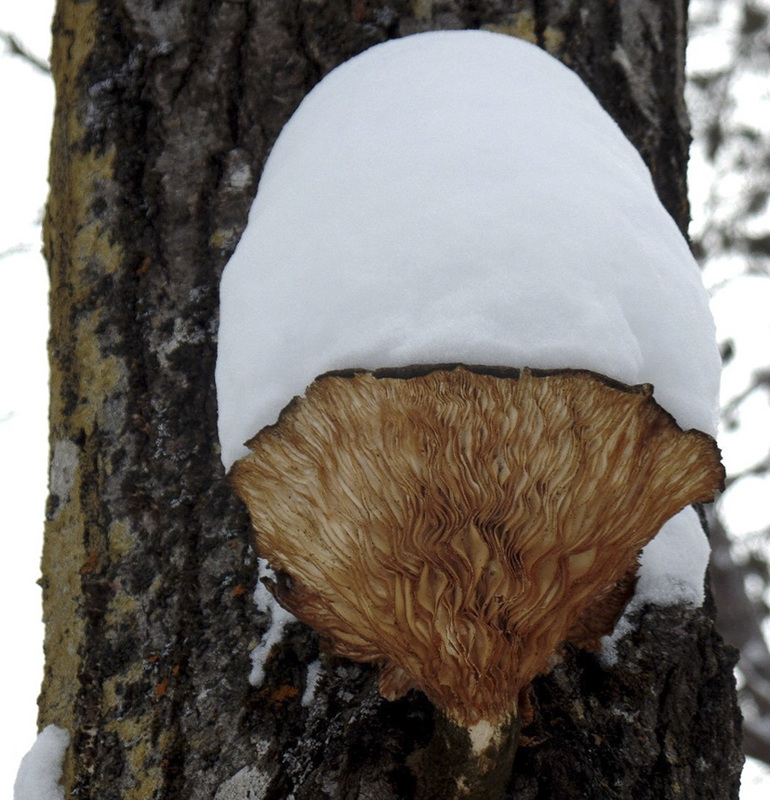 It may be the most common bird’s nest fungus in Canada and the northern two-thirds of the United States. It grows on sticks, wood chips, humus, vegetable debris, and manure. Although common, its small size makes it difficult to see. The fruiting body is a very small bowl-shaped “nest” containing several tiny, egg-like capsules. When young, it is yellowish, densely hairy, and topped with a yellowish lid. Eventually, the outer surface sloughs off and the lid ruptures and disappears. The mature mushroom has a hairless, brown, shiny, outer surface, and a smooth, white inner surface. 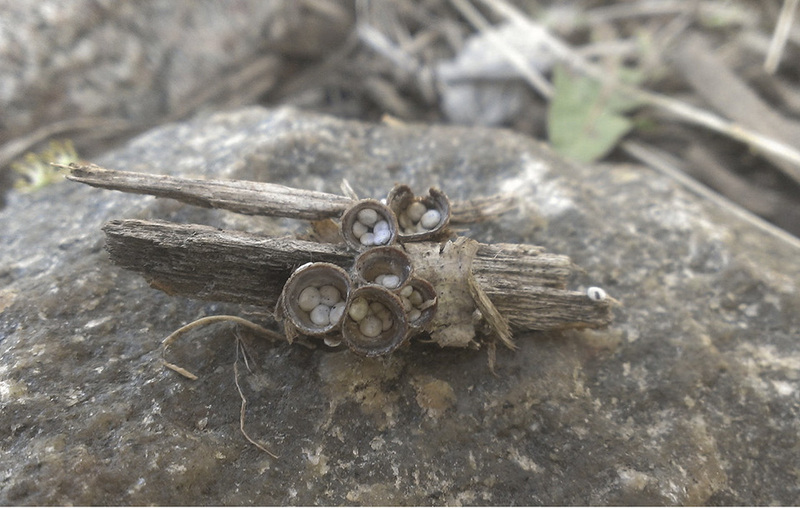 Inside the hollow nest are several tiny, white, circular, flattened capsules (eggs). The eggs are attached to the side of the nest by a long, thin, elastic, white cord that can be seen only with a hand lens, a needle, and a lot of patience. The eggs are disbursed by raindrops and wind. Common Bird’s Nest may be edible but is too small and tough to be worth the effort. 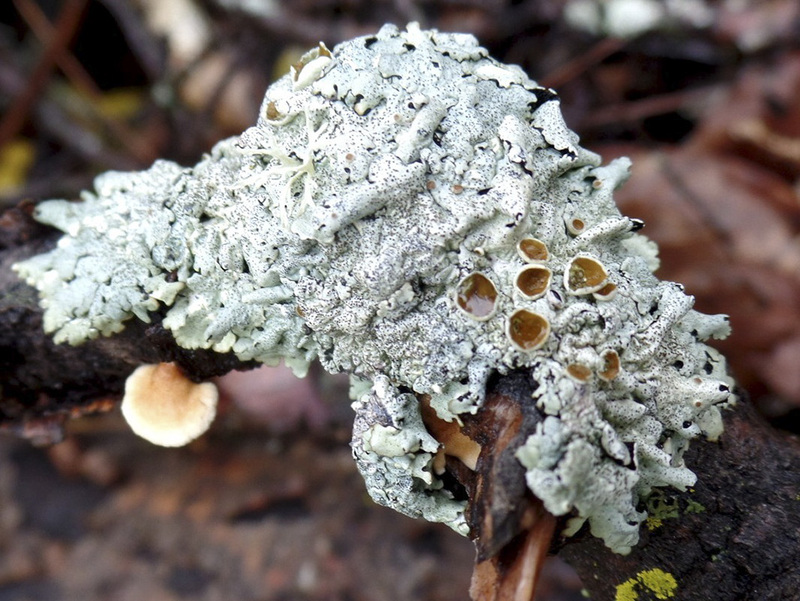 This entry was posted in Fungi and tagged Common Bird’s Nest, Crucibulum laeve on November 19, 2018 by John Valo. 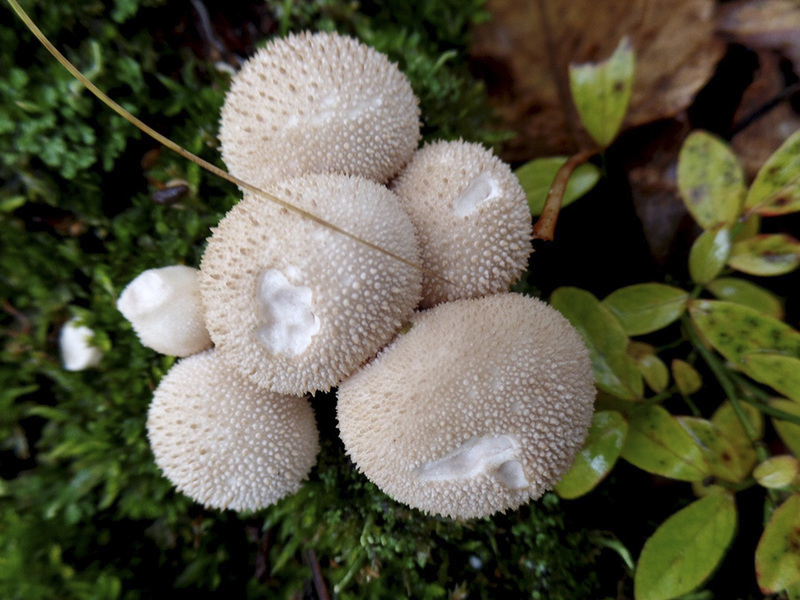 Common Puffball (Lycoperdon perlatum) is a very common, very widespread, easily recognized mushroom. It has a worldwide distribution, found on every continent including Antarctica. It may be the most abundant woodland puffball in North America, though in Minnesota Pear-shaped Puffball is more common. Common Puffball grows on the ground in woodlands under trees, on roadsides, in open areas, and even in urban areas. It is found from July through November usually in clusters. It is shaped like an upside-down pear, with a broad, round or flattened top and a narrowed stem-like base. Its white surface is densely covered with small, white, cone-shaped spines and more numerous tiny, white spines and granules between them. The spines are easily rubbed off and as the puffball matures they turn brown and fall off, the large ones leaving conspicuous pockmarks. A raised pore forms on the top of the maturing puffball. When ripe the pore ruptures, exposing the spore mass. 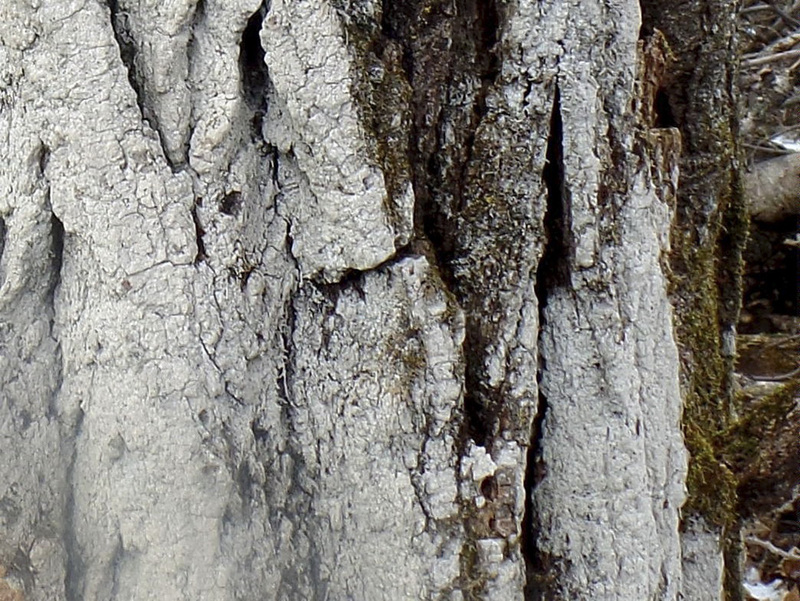 Pores are disbursed through the opening by wind, rain drops, falling twigs, and curious hikers. Common Puffball is edible when firm and white but is bland and may be bitter. This entry was posted in Fungi and tagged Common Puffball, Lycoperdon perlatum on November 2, 2018 by John Valo. American Starburst Lichen (Imshaugia placorodia) is found in the United States from Maine to Minnesota and south along the foothills of the Appalachian Mountains, in the northern Great Plains, the central and southern Rocky Mountains, and the southern Intermountain Region in the southwest. It grows on the bark of pine trees. It is almost restricted to pitch pine, jack pine, and Virginia pine in the east, and to ponderosa pine and Douglas fir in the west. It is rarely found on oak. In Minnesota it is found only on jack pine. 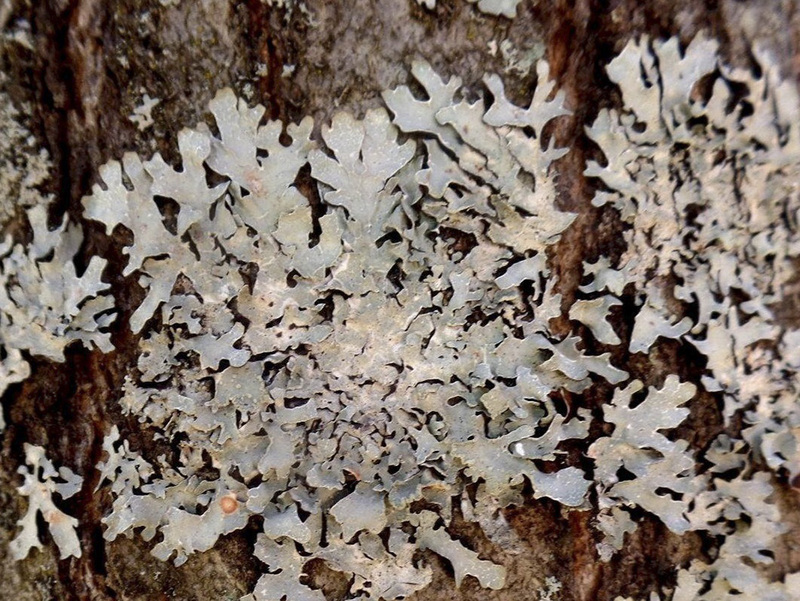 American Starburst Lichen is identified by its leaf-like growth; grayish-green upper surface that usually has black, pinprick-like dots across the surface and on the margins; brown, spore-producing cups that are sometimes abundant enough to conceal the leaf-like base; and its occurrence restricted to jack pine bark. This entry was posted in Fungi and tagged American Starburst Lichen, Imshaugia placorodia on October 31, 2018 by John Valo. 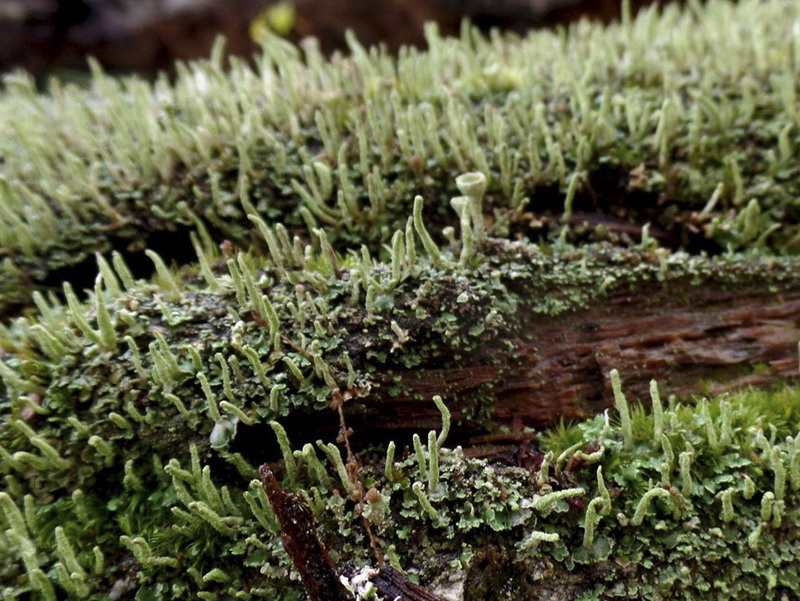 Common Powderhorn (Cladonia coniocraea) is a widespread and very common lichen in Europe, Asia, and North America. In the United States it is found from the east coast to the Midwest, including Minnesota, on the west coast, and in the Rocky Mountains. It grows in the shade on decaying stumps and logs and often at the bases of trees. It is resistant to pollution and can be found in urban areas. Common Powderhorn produces two types of green to grayish-green vegetative growth: a flat, overlapping, leaf-like scale that adheres closely to the substrate; and a slender, hollow, vertical stalk with a pointed tip. The undersides of the basal scales are white because they lack a protective outer coating. The surface of the stalk is mealy due to a covering of tiny reproductive granules. This entry was posted in Fungi and tagged Cladonia coniocraea, Common Powderhorn on October 17, 2018 by John Valo.